When you live in the country, going to town everyday for groceries, gas or entertainment isn't always an option. In fact, it isn't really a great choice when you live in town either. The more you go to the store, the more money you spend. When you're trying to save money on groceries, going to the store more often kind of defeats that purpose. That's why I try to stick to going to the store once a week and making sure to have a list of what I'm buying. 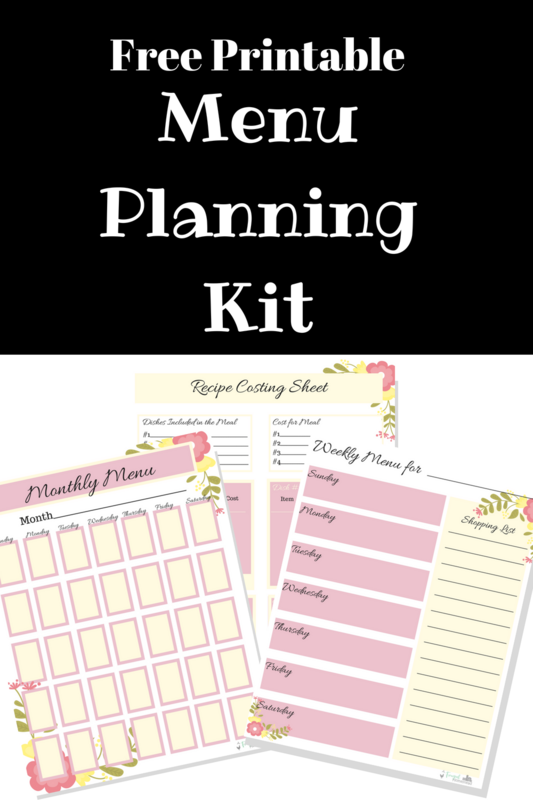 To be successful at sticking to my list I like to menu plan. Well, it's simply planning out your meals for a week, bi-weekly or monthly. Having a plan helps you save money. How? When you have a plan it is much easier to drive past the pizza place or not say "let's go out to eat". Of course, when you live in the country, having a plan helps you know what foods you might need to have on hand and helps ensure you haven't run out of need supplies. Like in this great article about 5 Things I Wish Someone Had Told Me About Meal Planning. I am going to admit one of my favorite household chores is menu planning. I love to decide on what meals we are going to have. I don't usually have specific breakfast or lunch menus. Mostly because it varies from day to day and season to season. But dinner, I always have a plan for. I start with my list of family favorite meals and my favorite cookbooks. What recipes sound good, what meals will my family eat, and what supplies do I already have on hand. Each of these will help me decide what to add to my menu. For instance, if I have an abundance of green beans from my garden, that may effect what I choose to make like maybe stir fry or a foil dinner to use up those green beans. I also look at seasons, summer I try to do a lot of grilling or outdoor cooking to keep my home cool and in winter I'll do more soups and stews to keep everyone nice and cozy. I personally like to plan out my entire month. That being said, I don't usually follow my plan to the letter. In fact, I usually mix it up quite a bit from week to week but I do stick to my monthly menu in the fact that I will make everything during the month. It just might not be on the exact date I put it on my menu. Tip: Keep your monthly menu planners. Make sure to label them with month and year. You can go back year after year to see what recipes you made that month. It makes planning and decided on recipes so much easier. Get more great tips in this article. Once I have my month planned out I put together my plan for the current week. I'll plan to main dish, side dishes and breads. I do it this way so that I can cost out my recipe easily. Why should you cost out your recipes? When you are trying to save money, it helps that you can SEE the savings. Costing out a recipe is a great way to see how making your food at home saves you money. 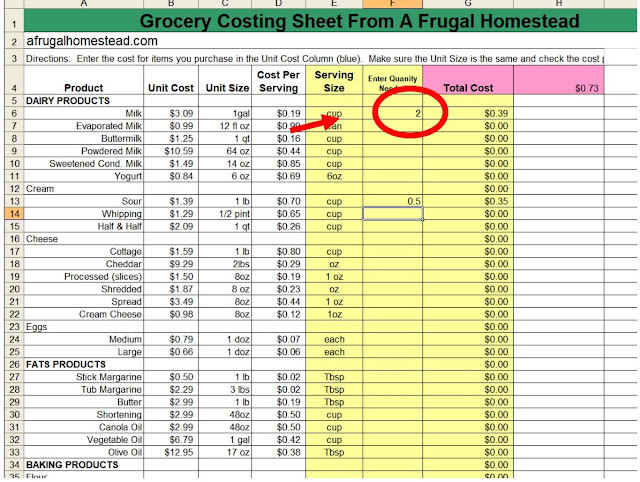 You'll need to start by using our free Food Costing Spreadsheet. (Get your copy for free HERE.) 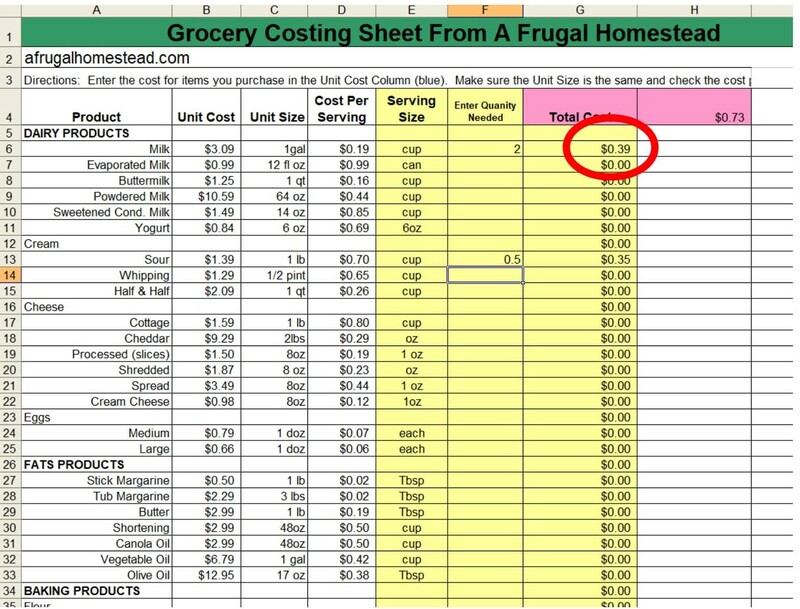 Below you can see how the food costing spreadsheet is set up. There are 3 columns in yellow: serving size, quantity and cost. Serving size is important to note because if the amount of product you need is in cups but your recipe calls for ounces, you'll need to do some conversions. The next yellow column says "Enter Quantity Needed". Here is where you enter how many servings you need. So I entered 2 for my 2 cups of milk. You will notice in the next yellow column there is now a price. 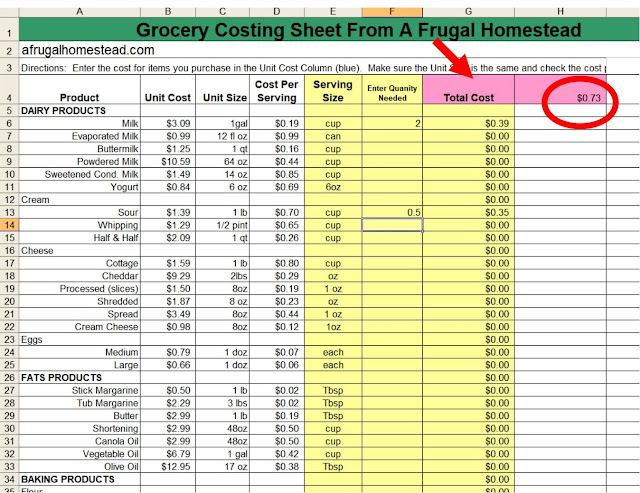 Each time you enter a quantity, the spreadsheet will tell you how much you are spending. It is a great way to quickly see what a serving or a recipe will cost. Lastly, once you have entered all your quantities into your spreadsheet, you'll see the total for the entire recipe in the pink box. You have just costed out your first recipe. I love this process because I can specifically see what 1/4 c. of milk will cost and not just 1 c. You can find out exactly what that recipe of homemade chicken noodle soup will cost and not just estimate. Since you can download the spreadsheet for free, you can also change the cost of items so they better fit your particular area or put the cost at zero if you grow your own foods and don't have to pay extra for them. Once you've costed out each recipe, now you have a great Recipe Costing sheet you can save in a binder and retrieve each time you make that meal. 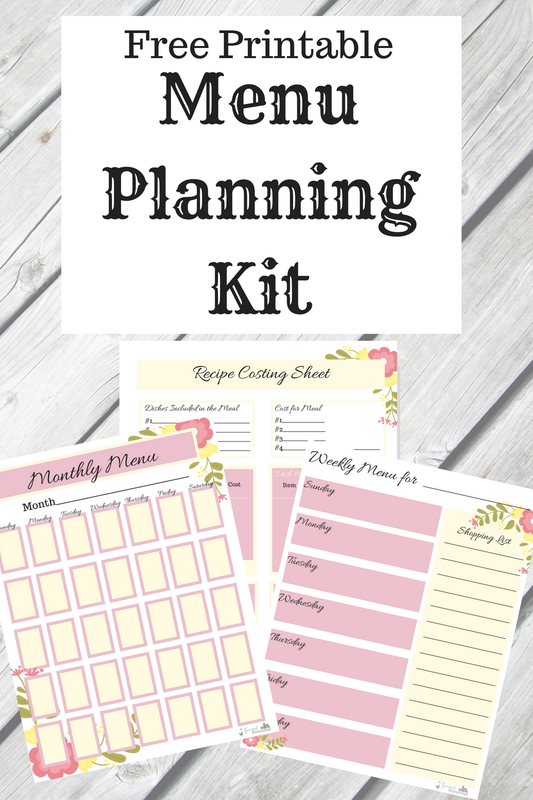 You can plan your budget down to the penny for your meals and save loads of money doing it. Yes, it will take some time to build up that recipe costing library. 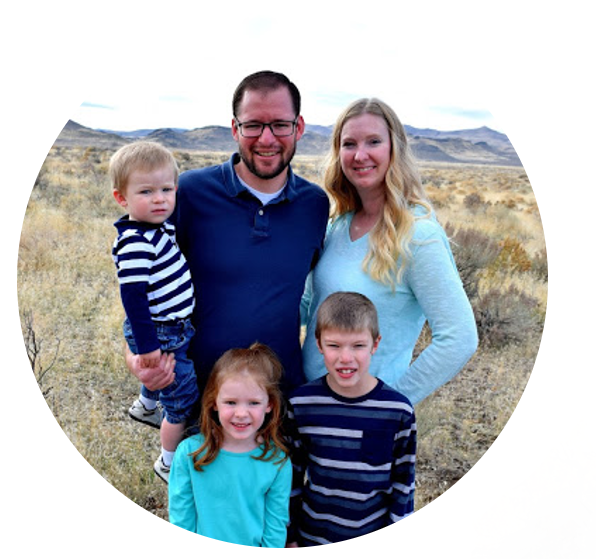 But once you do, you'll be set and can really start saving money and creating meals and menu plans that your family enjoys for pennies on the dollar. I hope this helped you see the value in menu planning to save money. I know for a fact this works. I have used this method for 11 years. 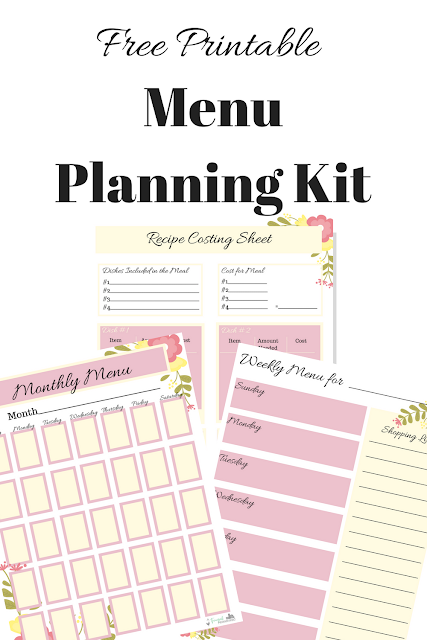 Not only do I love to see how we can save money, but it also helps me be more creative in my recipes and finding alternatives in my menu planning to save even more money.